At the outset, I wish you all a very happy new year. I know am a little late in posting this, but well it is better than not doing so at all. I know I have again faltered in my promise of posting regularly. Three months of absence from the blogosphere (or is it BratoSphere?) is complete inexplicable. I agree. The rapidness with which things have been happenings and the ups and downs of everyday life has led to the delay. The last three months have been a crazy, emotional period which I would sure remember for a long time to come. I was home for a good one and a half month on a holiday (probably my longest visit home after I have started working). Overall, 2013 has been one crazy year which for sure has changed my perspective on life forever. Every New Year brings with it a new hope for a new fresh beginning, and this year promises to bring in a lot of positive change. There are a couple of initiatives planned for this year, which I hope see the light of the day as planned. In addition to the social and professional promises, personal life also promises to be fulfilling. So, 2014 sure has a lot to look forward to. I am totally geared up to lap up all the opportunities. Are you? 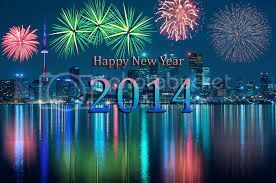 With this, signing off, wishing you all once again a very Happy new year 2014. See you soon.